Keyboard Partner Tools | DREVO :: Game With Cool Tech. DREVO Keyboard Partner provides you with convenient tools to improve key actuation speed, reduce keyboard sound and maintain keyboard clean. 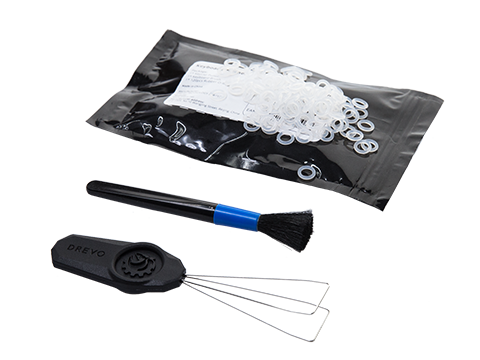 Silicone O-Ring Dampeners can reduce keystroke sound and provide faster actuation with a 1.5 mm thickness; Transparent O-Rings allow backlighting to shine brightly through without obstruction. DREVO Keycap Puller can bent to fit onto every keycap and hold up to 3 keycaps, which will make keycap removal much easier and quicker. Cleaning Brush is made of durable ABS and soft wool. It is great to remove the dust of components and keep the keyboard clean.